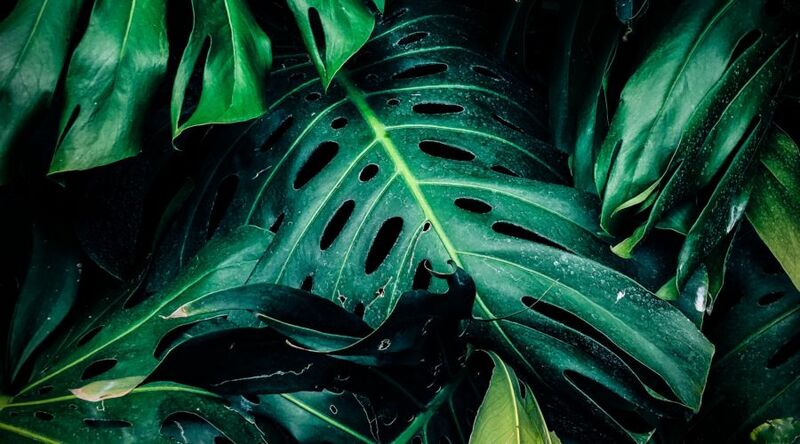 Also known as the Swiss cheese plant, Mexican breadfruit, or hurricane plant, monstera deliciosa is identifiable by its sizable, shiny green leaves that bear large cut ribbons and holes. The easy-to-grow houseplant is native to southern Mexico and Central American rainforests and if grown outdoors, can produce flowers that develop into edible fruit. However, contrary to its name, translated into English as “delicious monster,” the giant leaves are poisonous if ingested. Nevertheless, monstera continues to be a houseplant favorite due to its low-maintenance needs and striking presence, transforming any room it graces. One of the most effective ways to grow monstera deliciosa is air-layering. To do this, find a leaf growing out of a stem with a short aerial root below it. Just under the node, make an upwards slanted cut about halfway through the stem. Place a small piece of plastic in the cut so it doesn’t close up and will encourage the plant to grow roots. Take a fist-sized amount of damp sphagnum moss and wrap it around the cut and the node. Holding the moss in place, wrap it in clear plastic wrap so you can see how the roots are developing later. Secure it with string or twist ties. In a couple of weeks, you should see roots developing in the moss. Once you do, remove the plastic, cut the stem, and pot your new plant in its new home. Plant in well-drained soil and a pot with drainage holes. Water when the top of the soil feels dry. Though not necessary, the plant will flourish with regular misting on its leaves. Store in normal indoor temperatures, with exposure to filtered light and high humidity. Monstera deliciosa is a climber and in its natural habitat can grow over 60 feet into a tree canopy, so it is important to provide the plant with moss sticks or something nearby to climb onto (for example, exposed wall pipes, a tall lamp, or a trellis). If you want to mix up your monstera or add another variety to your collection, look for a multi-colored type called monstera deliciosa variegata. It sports white sections on its leaves and is much more rare and slower-growing.